This software offers a solution to users who want to find files by metadata text. For example, if a. Jpg has the metadata camera maker sony then typing 'son' will retrieve the file path and metadata. There is a feature to save your results as a text file. 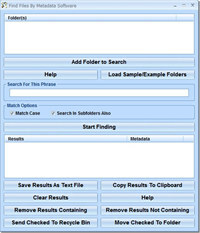 Find Files By Metadata Software is a graphic program that works under windows xp, windows vista and windows 7. It supports both 32-bit & 64-bit windows editions, therefore it could run faster on 64-bit computers. Estimated download time for Find Files By Metadata Software on a common adsl connection is less than a minute. Version 7.0 was released three thousand twenty seven days ago by Sobolsoft. Click the green download button to download it now.